Interested in training teachers in your area to integrate filmmaking and media arts into content instruction? Or establishing and expanding your organization, theatre, or district’s educational impact? We can help you create best practices for integrating media arts education into your community through classroom instruction, standards-based curriculum, teacher training, and student showcases to diversify your audience and expand your funding base. 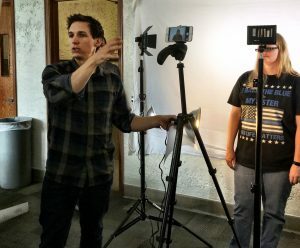 Media Education instructor Danny Schmidt discusses lighting techniques at a SHIFT workshop. SHIFT offers grades 4-12 educators immersive, high-quality professional development and curriculum that supports the integration of the filmmaking process into educational settings. Workshops and instructional materials provide comprehensive, standards-linked lesson plans to guide educators on how to produce documentaries, public service announcements (PSAs), instructional videos, personal narratives, and other short film projects with students. The SHIFT model is committed to strengthening teacher practice, increasing student achievement, and developing critical thinking, problem-solving, and communication skills. Film Spark pairs curated documentaries with standards-linked educator study guides written and published by Utah Film Center. Each volume features 12 custom study guides and corresponding films. The program, for grades 6-12, focuses on supporting the development of communication, critical thinking, media literacy, social action, and media creation. Volume 1 tackles contemporary social issues, Volume 2 features STEM-related films, and coming soon, Volume 3 highlights lesser known biographies! Our Media Education staff will come to your organization and conduct a two-day workshop (16 hours) training local educators to integrate filmmaking into classroom instruction. A national standards-linked curriculum manual will be provided to all participants. Create an engaging documentary learning experience in your organization through our standards-linked study guides. Increase the program’s effectiveness with on-site or remote training sessions led by our staff. Interested in establishing a media arts educational program at your venue? We can train your staff on-site, or have them come to us for training in Utah. We are happy to discuss a customized experience for your organization. The Mars Generation study guide.